On Sunday, my friend Catherine and I went to brunch at Boscos Squared in Overton Square (get it?). I was also there just a couple of months ago with my friend Bri. *My love of How I Met Your Mother is so huge. And I am absolutely Ted. You just don't go to brunch alone. Maybe that's bucket list item - go to brunch alone. I'll add it to go to Angkor Wat, pet a penguin, and meet David Bowie. Yes, that is seriously my list. I love this show so much. 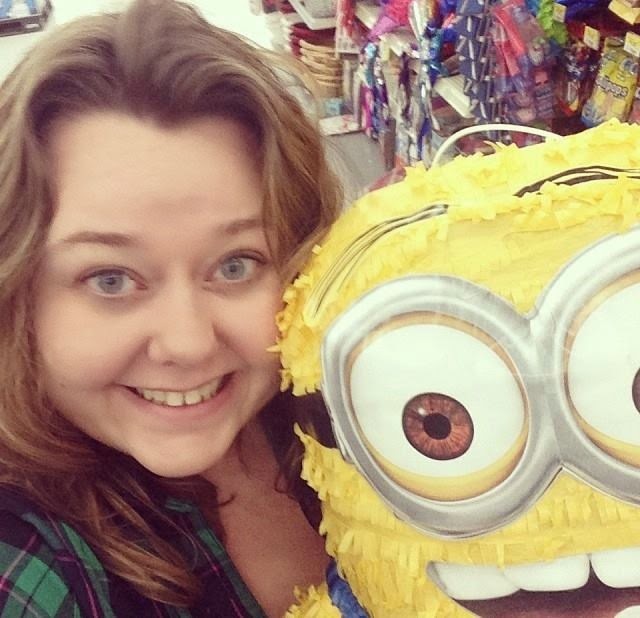 Maybe I'll add "make Jason Segel fall in love with me" to my list too. I love brunch, and I love Boscos. I've been there a million times since moving to Memphis, and it's a great place to have a small party, sit at the bar and read, hang out with friends, or sit on the patio for brunch. You have to sit on the patio. I love Memphis. And I really like live music. Unfortunately, the music at Boscos is a live band who play way too loud. Maybe I'm old, but jazz should not be this loud. So you sit on the patio for brunch, but they have a great bar any other time. There is a particularly surly bartender who I avoid like the plague, and I accidentally got her the other night, but other than that, everyone I've ever known that's worked there has been awesome. It was nice out, and the patio has little umbrellas on the tables, so we were totally cool, even in July. We started out with some mimosas. 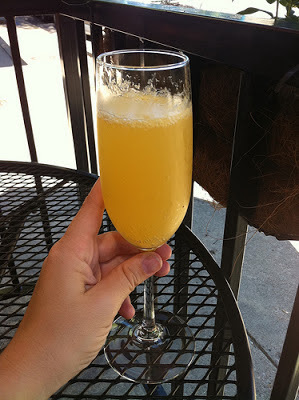 *I of course failed to take a picture of my mimosa, so this is one from ilovememphisblog.com. Ours were about twice this size though - ask for a double, which is $7. They're mimosas are really good. Not too much champagne, but enough that it's fizzy and fun, and good, medium-pulp orange juice. And it's orange juice, so hooray vitamins! I got the waffle last time I was there with Bri, and their waffles are fantastic. Crispy edges, fluffy but not squishy in the middle, and I love their syrup. Which I also dip my bacon in. This time, though, I decided to go more the lunch route. I really like eggs, but I'm sort of opposed to paying a ton of money for egg dishes that I can make myself because eggs are cheap. And easy. And Target new has half-dozen packs of organic eggs for us single people! Huzzah! But I got a burger. A delicious, juicy, HUGE, if not quite huge enough for me to feel bad about spending $12 on a burger, burger. *from the Boscos Little Rock Urbanspoon page. I always feel weird taking a ton of photos of my food with people who don't also do that. 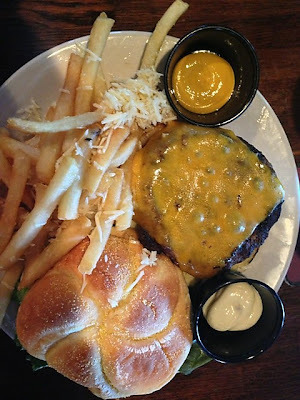 But my burger looked exactly like this, and I got the garlic parm fries, which are the best dollar extra ever. My only complaint about Boscos this particular trip was that my burger was nowhere near medium. Medium rare-ish was a little closer. I ate it, and it wasn't even a huge complaint, but if undercooked burgers are gross to you, order it up a little. The real star of the show at Boscos, brunch, lunch, dinner, or late night, is the beer. I'm partial to the pizzas late at night, but the beer is why everyone goes - the pizza is just to soak it up. The other night, I got the BBR - Boscos Blue Ribbon. Which was sort of like a PBR but, yeah, better. And twice as much, but at least that much better. I drink PBR pretty regularly, and if it tasted like this, and was cheap, I'd drink it more. And then be that drunk girl passed out on the sidewalk, probably. 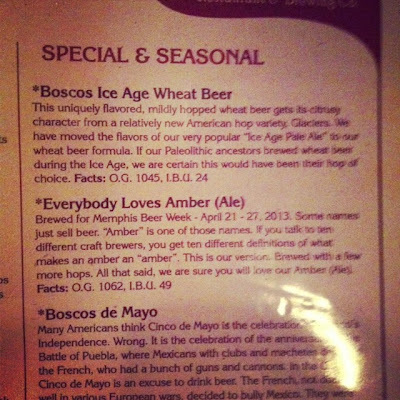 The seasonal "Everybody Loves Amber (Ale)" was, of course, my favorite of all time, but if I don't like any of the seasonals, you can't go wrong with the Isle of Skye Scottish Ale or the IPA. 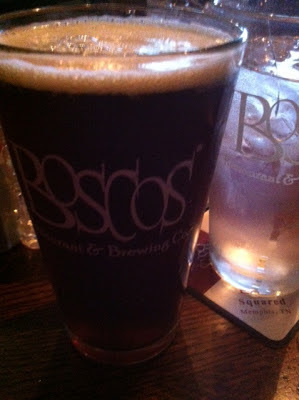 Boscos is great for pretty much any gathering - my family and I went for Easter last year, and we've gone a few other times, and I've gone there on dates several times. And I just remembered I have a free beer token I haven't used yet from when I went there on the last Dishcrawl. Who's in? I love Boscos. 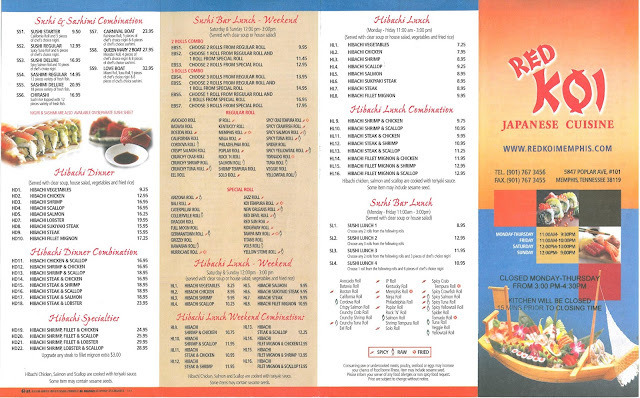 It's my favorite default food place around here. I used to meet C&C there just to hang out and drink beer and nom on sweet potato fries, and I love the buffalo chicken pizza, and I love that you can order tiny delicate glasses of beer (what are they, like 9 oz?) for those times when you're not ready to stop drinking, but you don't want to finish another entire drink. I didn't know about the tiny glasses of beer! Sometimes I want to try something but am not sure - that's a great idea. Let's go get buffalo chicken pizza soon? I was thinking the same thing while I was posting this and eating leftover pizza! Thanks for the comment!